Happy New Year veggies, aspiring veggies, part-time veggies, and new veggies of 2016! I’m hoping that this year, more and more people will make the switch to vegetarian or vegan. I was talking to some vegan friends during the Holidays about how much easier it is becoming to be a vegan in this world. There are so many great vegan options, mock meats, and substitutes for pretty much everything…. and it only gets better every year! One of my favorite mock meat companies is Gardein. They have a ton of great tasting options – everything from beefless tips and veggie crumbles to faux chicken tenders, fishless filets and even holiday roasts. I use the Beefless Grounds a lot for tacos. They taste delicious right out of the package. Just thaw in a skillet for a few minutes, throw in a tortilla with your favorite toppings, and eat. No need for seasonings… they’re just that good! I also use them for spaghetti and stuffed shells (I’ll post a recipe soon, promise! ), and this Vegan Queso Dip. They’re so good that people are surprised when I tell them that they’re vegan! I came up with this recipe a few years ago and tacked it on as a variation to my Vegan Macaron and Cheese recipe. However, it’s been getting so much love that I thought it deserved it’s own page. 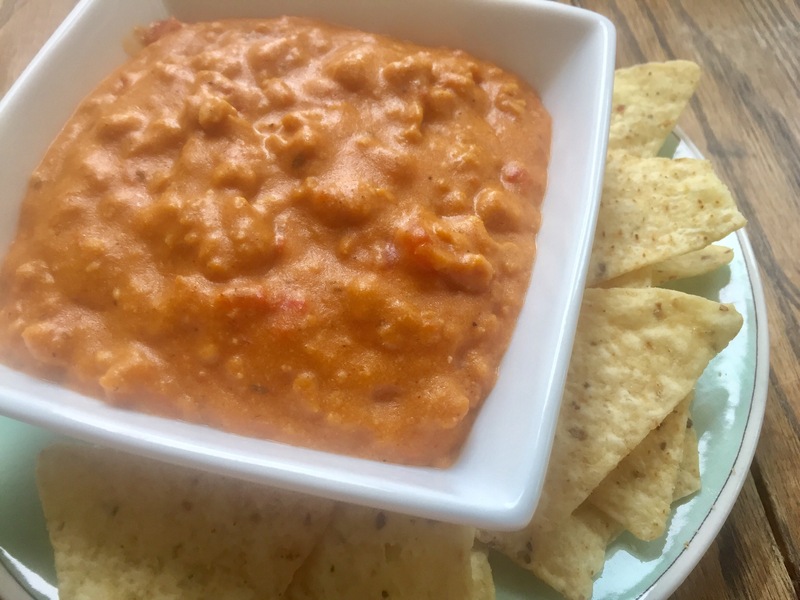 So, I may be biased… but I think this is definitely the best vegan queso recipe. Other recipes out there use diaya cheese and way too much nutritional yeast – I’m really not a fan of either. There are other recipes that use carrots, potatoes, and onions to make a vegan cheese sauce. I’m not a fan of that either. Mine uses cashews and just a small amount of nutritional yeast for the cheese sauce, the same sauce I use to make my vegan macaroni & cheese. This dip can be made and eaten the same day or the next day. It keeps really good for 3-4 days in the fridge. And, it can be put in a crockpot to take to a potluck. Just be sure to keep it on the lowest setting to avoid scorching it to the bottom or turning it into lava! In sauce pan, make cheese sauce according to directions. In separate sauce pan, combine water and taco seasoning. Add veggie crumbles and cook on medium-high until most of liquid is absorbed. Once cheese sauce is thickened, add taco “meat” and salsa to cheese sauce and stir to combine. Heat and eat with chips! Great on nachos too!